Hair is more than what you see in the mirror. We give you a touchable, mess-free style. Goodbye bad hair days—hello confidence. Vibrantz® ‘Bridge That Gap’ is a trademark brand of Vibrantz Cosmetics Ltd.
We are proud to bring you quality hair and cosmetic products that help you to find your confidence again. We believe that good looks don’t come in a magic potion or expensive medical procedure, but through science, technology, and the very best ingredients we can give you tools to enhance your looks and reduce the appearance of aging. Are you ready to ‘Bridge that Gap?’ Get started here! 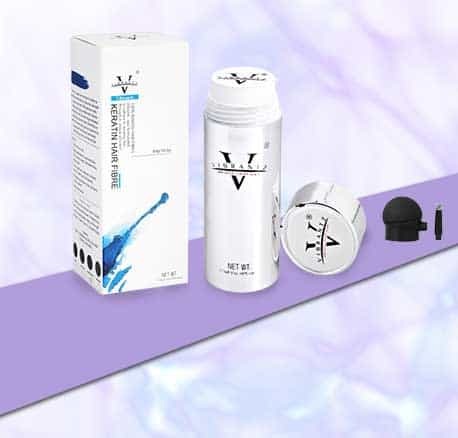 If you have thinning hair, a wide parting, or hair loss at the crown area that you wish to conceal, Vibrantz®’s innovative and proven Keratin hair fibres are the ideal solution for you. Many brands claim “100% natural keratin” composition but often this is not the reality. Avoid irritation and poor performance with our solution that features nothing but 100% natural keratin, with zero synthetic additives or chemical components. Don’t believe the hype, believe in Vibrantz®. 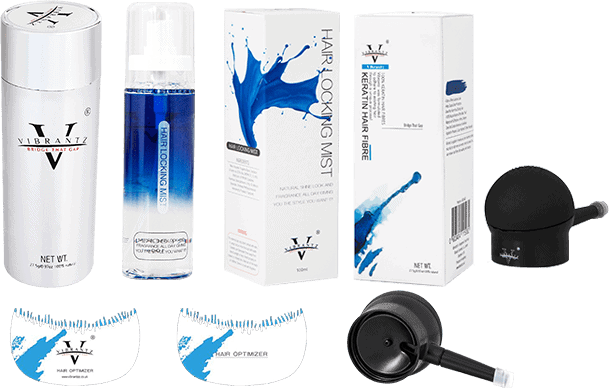 We are the first hair thickening solution company to bring this unique product to market with proven product claims and stellar reviews by our worldwide unisex audience. With Vibrantz® you truly do Bridge That Gap! Don’t let insecurity hold you back. We’re confidence—it’s nice to meet you! Actually we’re the bridge to your confidence, as the market leader in the hair fiber industry. Our leading technology delivers instant hair thickening that’s natural, totally believable, weather-resistant, and actually affordable. Too good to be true? Vibrantz® fibres are made from the same proteins as your hair, merging flawlessly with your existing follicles using electrostatic charge optimisation for instant hair thickness that lasts all day. Our unique microfibre concoction disguises thinning hair and transforms fine hair with pure volume. The fibres are undetectable and the results are incredible. Vibrantz® covers all hair types and conditions with 8 natural colours so you can easily find your perfect blend, providing incredibly realistic coverage to any area so you look great no matter what hairstyle you rock! What’s more, our product protects your scalp and hair, in no way harming or impeding natural growth, and is totally waterproof so no more worrying about the rain or the gym! We’re so confident that you’ll have a great experience with our hair thickening fibres that we offer a full 30-day money back guarantee. Warning: External application only. Avoid eye contact. If product enters eyes rinse well with water. If irritation occurs cease use. Avoid inhalation. Keep out of the sight and reach of children.